Empowering your group communications with simple technology. Need to communicate with your group quickly and efficiently? SMS Group Chat provides the perfect tool. Designed for enterprise-level groups, this SMS application has your group messaging needs in mind. Get schedule change notifications to everyone affected. Open a discussion about an upcoming project. Alert an entire group at once about an emergency situation. No worries about compatibility issues or required apps. This is pure text messaging. It works with any phone, any time, anywhere. Convenient. Reliable. Secure. What makes group text messaging an innovative solution for your enterprise? 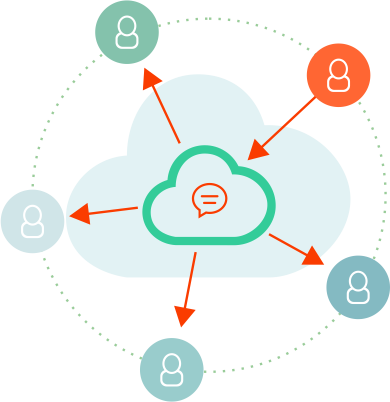 Collaborate and communicate with your closed user group via text messaging. Instantly get updates or send alerts to everyone in the group at anytime and anywhere. Lower your mobile hardware and ongoing costs with BYOD policy. With no compatibility issues and apps to install our simple group messaging amazingly works on any mobile device. Unlike mobile application messaging that always relies on data to deliver your messages, text messaging works anywhere you have a mobile reception. Utilize our state-of-the-art and secure communications system to deliver your messages across all major mobile networks in Canada and the United States.